View of the inner facade of the Water Tower at Kenilworth Castle in Warwickshire. Kenilworth is the largest castle ruin in England and was one of the country’s most magnificent noble residences. The Water Tower stands on a corner of the eastern curtain wall encircling the castle. With the Swan Tower and Lunn’s Tower it is one of three angle towers on the wall and was so called for its position overlooking the lower pool, part of the castle’s spectacular water defences. In 1244, the castle was granted to Simon de Montfort, Earl of Leicester and the tower is thought to be among surviving mid-13th century fortifications made by him. 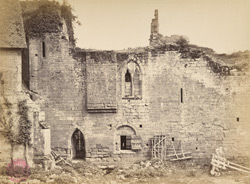 In his guide to the castle, the Reverent E. H. Knowles comments: “In King John’s time and the earlier years of Henry 3rd…the Entrance Tower on the Warwick side was altered from wood to stone; the Water Tower was erected, and Mortimer’s Tower was enlarged.” This view shows a patchwork of narrow slitted and arched windows on the facade.